Welcome to the Worcester Sun. We launched in August 2015 with the goal of putting “local” back into local journalism. The Worcester Sun is locally owned, and its co-founders, Mark Henderson and Fred Hurlbrink Jr., live locally. We believe journalism supported by advertising only puts publishers in the position of searching for stories that gather the most clicks. Unfortunately, most of the time popularity and meaning are not the same. We take a longer view of news. We spend the time to give you news we hope is relevant, that resonates beyond the simple measure of pageviews and unique visitors. We provide long-form, civic-minded journalism that won’t be offered anywhere else and we hope is worthy of your support. To do this, we charge our subscribers (we call them members) $2 per week. For that, you get great stories that are well-reported, well-edited and presented without ads. We created this Free to Read section for two reasons. First, we want people to be able to sample some of our work before becoming members. Second, we want to let everyone know about some of the good work being done in our community and expose you to some great local businesses that you should frequent. Our regular features include Sun Shine, a look at people and organizations helping others; Local Business Spotlight, which features new businesses and the people who start them; Hidden Gem, which features interesting local restaurants you should frequent; and Local Crowdfund, which showcases area people looking for help funding an interesting idea or new business. All we ask in return for this sneak peek is for you to subscribe to our email newsletter so you can keep up to date on what we’re doing. A signup form appears on the bottom of each Free to Read article. We send out emails twice a week, on Sundays and Tuesdays, and you can unsubscribe at any time. 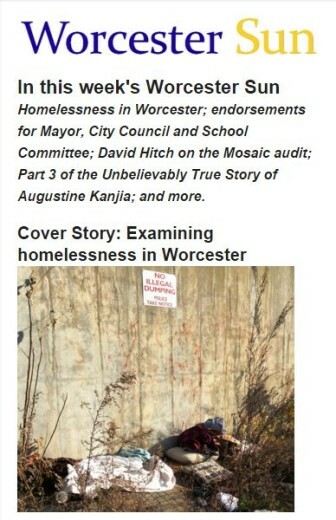 To date, our contributors have more than 400 years of journalism experience, most of those in Worcester. We hope you enjoy this free look.